If you have never gotten the opportunity to see Marty Weintraub from AimClear speak you are missing out. I have seen him several times and it is always an informative session with actionable tips given by Marty. Your in luck though if you arent heading out to any of the major conferences soon, Marty has had a new book released a little bit ago so you can get some of those great tips without actually having to travel. 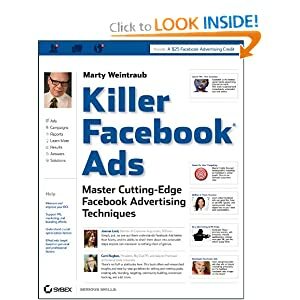 Killer Facebook Ads: Master Cutting-Edge Facebook Advertising Techniques is a great read that will give you the ability to get your Facebook advertising to a whole new level. I’m not ashamed to admit that I was a little behind in getting my Facebook ads up to snuff performance wise compared to my other platforms. That’s why when I saw @aimclear mention that it was up for preorder I quickly had it in my shopping cart and was waiting for delivery. It was well worth the wait and though I haven’t finished it yet, I can confidently say that it is worth picking up if you have any intentions of running Facebook ads, or are currently running them and want to boost performance. I won’t insult Marty by putting any of his work for free here on the blog, do yourself a favor and pick it up yourself!